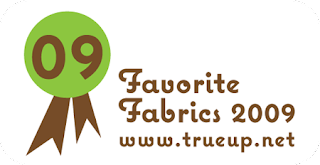 True-Up is having a great fabric celebration/give-away. I had to join the party...so here are my favourites of 2009! 1. Favourite Quilting Weight Cotton Collection: Deer Valley by Joel Dewberry. But I still haven't bought any yet. But I will. When I get some of these darn UFO's finished. In the green and yellow. I figure if I finish 5 UFO's I can reward myself with some yummy Deer Valley. 2. Favourite Home Decor Fabric: You mean there is fabric other than Quilting Cotton? You're joking, right? Oh wait, doesn't Amy Butler's Love come in Home Decor??? 3. Favourite Trend (Motifs): I'm going to have to go with the whole Gnome thing. 4. Favourite Trend (Colors): I'm loving the aqua & tangerine movement. Biggest Fabric World Story/News: Heather Ross had a Studio Sale. And I got some lovely little mushrooms and gnomes! 6. 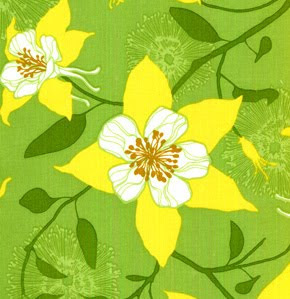 Favourite Floral Print: Those gorgeous Columbines from Deer Valley. I have columbines outside my house and the fabric just reminds me of home! (Photo from FreeSpirit). 7. Favourite Collection from Japan: Far, Far Away by Heather Ross for Kokka of Japan. I even splurged and bought some. But I haven't cut into it yet. But I will. I think. Maybe. Oh, it really is so beautiful! 8. Favourite Fabric Shop: Pink Panda Fabrics How can I resist Free Shipping in Canada? Really...Free shipping?! 9.Favourite New Fabric You Worked With in 2009: Wonderland by MoMo for Moda. I used this in my yet to be finished (yes one of my many UFOs) Double Wedding Ring. It is gorgeous. I love the reds. I'm a red girl. Oh, and I may have some FQs and a Charm pack destined to become a bag. 10. Fabric Collections I won't be able to resist in 2010 (aka Wildcard): Meadowsweet by Sandi Henderson, Nicey Jane by Heather Bailey, and of course, Hope Valley by Denyse Schmidt. Beautiful fabrics! Can't wait to see what will come in 2010. Good choices, my list will probably look similar if I can get it put together! From the looks of it, everyone is loving that Far Far Away. I better go buy some soon! You really MUST make something from that Far Far Away. Too beautiful to be locked away in a craft room.